Tranquille Sanatorium was just a typical treatment center built in 1907 to deal with the spread of tuberculosis. It started off as many other sanatoriums of the day did, being built in quieter areas or somewhere in isolation from populated centers. 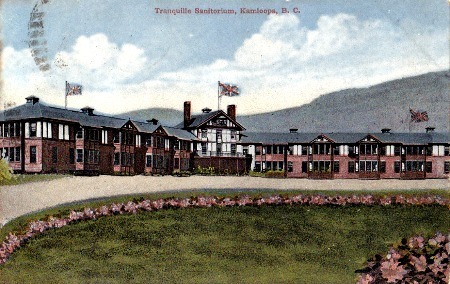 The unusual thing about this sanatorium was that a whole village known as Tranquille was built around it. It included many regular village features such as a fire department and stores. People often stayed away from such treatment centers for obvious reasons, as TB was contagious and untreatable in those days. The hospital closed in 1958 due to financial difficulties but the building reopened the next year as a hospital for the mentally ill. During this time the hospital was accused of poor treatment of the patients and unacceptable conditions, and so it closed forever in 1983. The building has remained abandoned since 1983 and was scheduled for demolition. There probably isn't a mental asylum which had a good reputation for its treatment of patients during the earlier decades, and it seems this place is no exception. The area itself is creepy just to be in, with many abandoned houses and out-buildings creating an atmosphere of emptiness. As for the actual ghosts which choose to linger here, who they are why they remain will remain forever unknown, but they don't seem to be scared of making their presence known. The tunnels under the main building are thought to be the hotspot of the area, with reports of people experiencing everything from being barged past by an unseen person, to muffled moans echoing down the tunnels. Please note though that if they haven't already been destroyed the tunnel themselves will be very decayed and quite dangerous to go in. Orbs and faint floating lights can be seen on photos from all around the area, and a strange twisting mist like formation often appears on pictures but cant be seen by the naked eye. One interesting tale comes from someone who came to the area after nightfall who claims to have been chased away by the mist like apparition of a past patient, but tales like this always seem to be a little camp fire storyish in my opinion, as if things like this were present here it would be the most haunted place in the country.